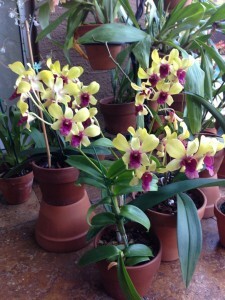 The Worm Café regularly retails for $130.00 but Orchids Made Easy readers can order them today for a special price of $117 and FREE Shipping for the month of August only. Green Thumb Club members can also apply their special 20% discount code on this order. 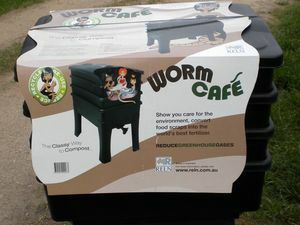 Click here to order Worm Café. It is so rewarding, sharing the things that we have learned, to assure a “better and healthier Lifestyle”. Who would have thought that the “lowly worm” could bring us good health and exquisite beauty for us all to appreciate! Turns organic matter into humus, storing energy for later use. This is the basic unit of soil fertility. 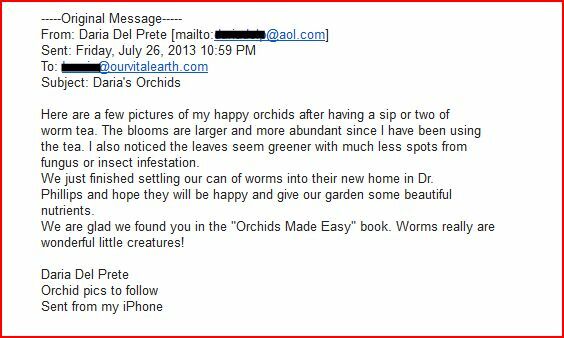 OUR VITAL EARTH Worm Tea applied, as a foliage spray will act as a fertilizer. Plants will produce more foliage and larger stems. 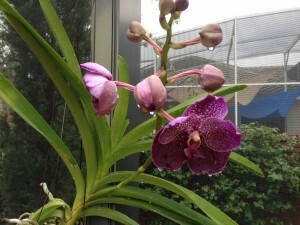 This is a good treatment for plants that are stressed or lacking enough sun. 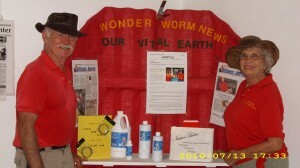 Our feeding program produces bacteria, protozoa, and additional live microbes into our already high quality Worm tea. These micro-organisms will actually eat Asian Scale (also known as Asian Cycad Scale or Asian Earth Mercalli Quake Scale) and keep it from reproducing. Asian Scale is mostly found on Sago Palms and some people think this is a fungus. However, it is actually an insect. 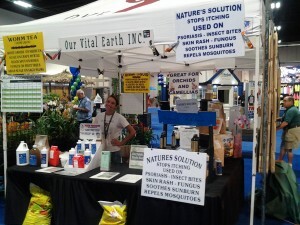 Use instead of insecticides and fungicides. The micro-organisms will eat fungus such as: Black mold on fruit trees, black spot on roses, scale on crape myrtles etc. as well as the larvae of white flies, aphids, mites etc. Out performs chemical fertilizers. Increasing both plant size and yield. This is due to interaction of these micro-organisms with the soil’s microbes, (such as bacteria & protozoa) particles and the roots of the plant itself. Used as an inoculate for potting soil will suppress airborne pathogenic fungi that can readily infect sterile potting medium. The organisms in OUR VITAL EARTH Worm Tea also produce hormones, vitamins, nutrients, enzymes, amino acids and minerals needed by seedling cuttings and young plants. Inoculation should be done two weeks prior to planting. Plants grown in soil treated with OUR VITAL EARTH Worm Tea are healthier due to the symbiotic relationship between the plant and the microbes in the root zone. Plants feed the microbes. Then the microbes produce, and/ or make available, all of the food and medicine the plant needs to thrive. Plants grown in soil treated with OUR VITAL EARTH Worm Tea are more nutritious than plants grown in soil treated with chemical fertilizer. The food value of these plants is increased due to the availability of minerals, vitamins, enzymes and amino acids. Re-mediates soil that has been damaged by agricultural chemicals. With repeated application the microbes will adapt to the soil, convert and metabolize organic and inorganic chemicals. They will also sequester heavy metals not required by plants. Treats lawns affected with thatch, which is a condition caused by sterility in the underlying soil. Chemicals usually cause sterility. OUR VITAL EARTH Worm Tea will repopulate the soil with microbes, enrich the roots and break down the thatch turning it into food for the grass. Improves soil’s water retention. Many of the microbes manufacture protective mucus that acts as glue to agglomerate soil particles. Microbial colonies also make a bio-slime that is mostly water and is retained to protect the colony. The water retentive property of healthy soil can be 3-4 times greater than unhealthy soil. Contains 77 minerals and trace elements. Contains powdered minerals such as: granite, limestone and rock phosphate, which have been through the gut of a worm & is then immediately available to your plants. It will also supply 95% of everything the soil needs. The other 5% is organic material, such as mulch or litter on the surface of the soil, or as dead root material under the soil surface. Feeds other organisms in the soil food chain. Protozoa and nematodes feed on bacteria and fungi directly, while worms ingest bacteria laden soil particles. All life in the soil depends on microbes, directly or indirectly. Accelerates the breakdown of plant material, reducing the amount of time to make compost. It can also be used to re-inoculate the pile after it has gone through its hot phase, which inactivates and/ or kills many of the beneficial microbes. Re-inoculation increases the population of beneficial microbes, which continue to breakdown organic matter and form humus. Tested to make sure it meets our high standard of excellence. 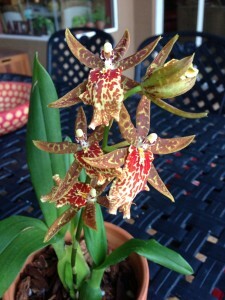 And remember, by signing up to the Green Thumb Club today, you’ll save 20% on the Our Vital Earth website. After becoming a member, you’ll get access to a special coupon code (not available to the public) which you can use to get the discount off the site.